Love and the complications surrounding it have long proven to be Joshua Radin’s songwriting forte. Though he never intended to be a live performer, there was little choice when the first song he ever wrote, “Winter,” was featured on an episode of “Scrubs.” The resulting fervor soon led to a record deal, and over the last decade, Radin has toured the world countless times, sold hundreds of thousands of records and topped the iTunes charts, played Ellen DeGeneres’ wedding at her personal request, and had his songs featured in more than 150 different films, commercials, and TV shows. 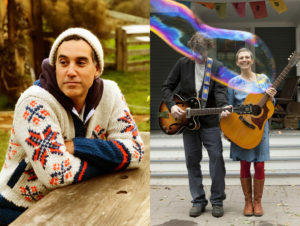 Singer-songwriters Deb Talan and Steve Tannen began writing together the night they met, and soon formed indie band The Weepies. On the strength of their simple yet insightful songwriting and distinctive harmonies, they quietly sold more than 1.5 million records with over 54 million streams on Spotify, 25 million views on YouTube, and over 110,000 followers on social media. They married and had three children, rarely touring but continuing to release their music.